These quotes were assembled by Elenore Goode in order to provide historical context for our work in ecological restoration and regenerative agriculture. “We are led to think of the prairie as flat, treeless and essentially stark and barren. Yet this is not a true picture of a prairie. How has our conception become so twisted? The problem begins with a confusion of two different words: prairie and plain. Both of these were originally French terms. They exist because – modern dictionaries not withstanding – they mean two different things. The opportunity for confusion of the two is great, for you could have a plain included within and part of a large prairie, but hardly a prairie within and considered part of a plain. A plain was a flat expanse which was altogether or practically treeless. It was a plain surface in every sense of that word, and also in the sense of the word plane. The prairie, on the other hand was seldom flat or treeless. The essential difference is shown by the most common way of describing a prairie. This was as rolling. No plain could actually roll, since it had to be flat. This, then, was the original Texas prairie. Imagine, those of you who know the lakes and bays and oceans, who have seen capes and headlands and islands, these scenes transposed into similar configurations, with slopes and hillocks and hollows of grass and flowers, and skirts and groves of trees in place of shores, points and islands. Time and again the explorers expressed feelings of relaxation and relief in moving out of either forest or large plains into prairies. But on to some details of the prairies. First, what was the relative amount of trees and grass in a prairie? No simple answer to this question arises out of the early accounts. It appears that this is because the proportions were so variable. There were prairies described which had so many trees that the explorers threaded through the narrow straits between the forests, and the openings were those beautiful little, locked-in meadows we have already described. Other prairies had the trees as only scattered islands…Then there were prairies with their trees few and standing singly…There were even prairies with large flat, treeless spaces – the plains within the prairies – between fingers of forests. Olmstead stated that the proportions of grass increased and trees decreased from east to west across prairies. This is as it should be if the prairie is actually the zone of juncture of the eastern forests and the western grassland – or the strip between them which neither can totally claim. Another crucial question about prairies arises – how much grass was in their meadows, and what was it like? Kennedy’s observer, Hall, is most specific of any about this. He tells us, “In the summer the prairie is covered with long coarse grass, which soon assumes a golden hue, and waves in the wind like a ripe harvest.” The point is that rather than a close-cropped, velvety sward, the prairie grass was a tall and stalky crop. By the middle of summer it had turned the gold of ripeness. The scene was, for most of the year, that of a standing or later and unharvested, falling grain field, with the breezes rippling the tall stalks like it does the ripened wheat on much of the same ground today. But if this is so, how could the pioneers call these fields lawns? We moderns are once again tricked by the narrow image a word may give to us of so little experience. Only for those of the last fifty years or so since the development of mechanical mowers had a lawn been merely inches high. If we are ever to imagine the low prairies of east Texas west to Dallas and the Blackland Belt, we must force ourselves to see these grass forests with the heads of their grasses often nodding as high as our own. The degree of difficulty we find in imagining this scene as we stand outside any of our Prairie Views or Grand Prairies today, with the grass hardly to our boot-tops, measures how far removed we are from Texas as it was. And so it was in the mixed-grass prairies, with the grammas, the dropseeds, lovegrasses, etc. topping out at three to five feet tall. They will still do it wherever they are left uncropped and the soil is yet undepleted. It was only the prairies of northwestern texas which originally had the short grass standing only a foot or so high. These were usually called by the explorers mesquite prairies, after the mesquite trees whose presence helped make them prairies instead of plains and after the excellent grass which grew associated with these trees. North Texas prairies had grass tall enough to hide all but the antlers, necks and tails of bounding deer or the humps of grazing buffalo, while south texas prairie grass was tall enough and thick enough to hide men crouching on sleds being pulled through it by oxen. What luxuriant cover this was! What a commentary on our greed is the naked, almost barren state of our overgrazed prairie pastures today, which will hardly hide a rabbit. Hall’s observations brought to us by Kennedy detail the scenes through the whole growing season: “The first coat of grass is mingled with small flowers, the violet, the bloom of the strawberry, and others of the most minute and delicate texture. As the grass increases in size, these disappear, and others, taller, and more gaudy, display their brilliant colours upon the green surface; and still later, a larger and coarser succession rises with the rising tide of verdure. The whole of the surface of these beautiful plains is clad, throughout the season of verdure, with every imaginable variety of color, from grave to gay. It is impossible to conceive of greater diversity, or a richer profusion of hues, or to detect any predominating tint, except the green, which forms the beautiful ground, and relieves the exquisite brilliancy of all the others. So there were enough forbs to sprinkle all this grass with flowers all the growing season. The ones we know had their season, and perhaps some of them grew in that rich mulch far taller than we see them today, while even taller ones may have disappeared along with the tallest aristocrats of the grasses. There were, in Texas, some special kinds of prairies. These seem to indicate special environmental situations prompting special biological communities, or else prairies with unusual topographic features. One of the most interesting of these was the “wee prairie.” The name does not indicate any tiny size of these prairies, but is a curious corruption of the term, “weed prairie.” These were apparently localized situations where little grass grew and forbes ruled exclusively. They were described in 1839, by Kennedy, as follows: “In their ‘wee prairies’, the counties of Robertson and Milam possess a characteristic of the soil peculiar to themselves. These prairies, unlike most of those in other localities, are covered with a thick growth of weeds instead of grass. These weeds are generally from ten to fifteen feet high, and so dense that they are almost impenetrable to man or horse, resembling in some respects, the cane-brakes of the alluvial region. The settlers highly estimate the productive power of the weed prairie.” De Cordova is the only other early writer to mention these, speaking of the “…immense bodies of fine weed-prairies, so proverbial for their fertility,” in present Falls County. As far as we know, these peculiar prairies were limited to the three counties named in these passages. A strange passage exists which can do little more than intrigue us. It consists of two sentences written by the Abbe Domenech about a situation encountered when travelling in what is now Cameron County at the southern tip of Texas. The Abbe relates: “We then passed over glades and prairies where the earth was so light and soft that sometimes it gave way under our horses’ feet. The rancheros call these tierras falsas (treacherous grounds): after rain they are very dangerous; man and horse sometimes sink and disappear in them, as in shaking prairies.” Was this soil so fine and sandy that it could form a quicksand-like mass after rains, or were there at that time old resacas so choked with partly decayed plant material that horse and rider could sink into them? Who knows today? At any rate, there must have been something unsteady enough that we can add the term, shaking prairie, to the list of strange Texas locales. The result of all of our modern activity has been to improve the drainage of wetlands. Our agriculture and our desire for convenience cannot tolerate water standing anywhere except behind our dams or in rice fields, and so we forget what the country was like before drainage projects. We therefore don’t realize what the low-lying prairies, on many of which we now have nice, dry cities, highways and farms, were originally like in the wet season. These were the prairies of Texas. They made up a larger part of the State than any other natural community. There was much variation in them, as they were themselves a curious blending of hills and plains, forests and grassland, forbes and grasses. One of the first agents in the destruction of the prairie was the so-called domestic animal. It was the practice of the pioneers to turn as many cows, sheep and goats as they could acquire loose in the prairies and reap the gain in offsprings of the prolific, semi-wild herds. In south Texas the missions pioneered by introducing the Spanish open ranching system full-blown, and the hers were prodigious. By the 1760s the five mission ranches in the San Antonio area were working a total of more than 5,000 cattle and 17,000 sheep and goats, while the mission Espiritu Santo, near present Goliad, had a total of 16,000 cattle by 1768. In north and east Texas the other settlers needed no old-world systems. They managed in their own ways to get the cattle and sheep and goats out onto the prairies and re-capture a part of the increase. One can imagine the destruction worked upon the prairie vegetation by such herds. 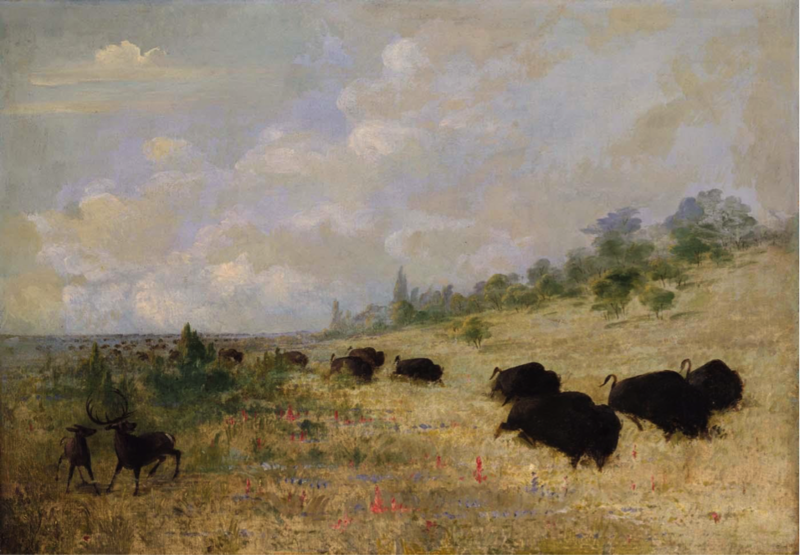 There was a respite as the mission activity dwindled and failed by the end of the eighteenth century, but soon after that the settlers flooded in, each establishing his herd and turning it onto the prairies. Add to these the myriads of wild horses grazing everywhere by then, and one must envision the tall grasses being whittled down year by year. The tall, standing biomass, the life of the prairie as surely as the trees are the life of the forest, was being eaten away. By the 1850s this process was far enough along that the prairie was often stripped, naked and dying, and it sometimes took some of its tormentors with it. There was another destruction being wreaked upon the prairie by this time. This fire was a new enemy of the prairie. McClintock’s mesquites were just dying from it in 1846. There is no evidence that the prairie fire started by lightning was ever any more than a freak happening of local consequence. Nor, contrary to many statements, is there any evidence that the Texas Indians ever used fire to drive out game until they learned the practice from the Spanish. But they learned that technique quickly, and the ranchers burned after them in their turn. Thus the prairies capital was repeatedly reduced to ashes. Herds of cattle and sheep and goats were always ready to chop off the new growth when it came back, and the prairies could not rejuvenate themselves. So by 1860 the grand prairies existed only in pitiful remnants, and we leave them here.